Heat oven to 375ºF. Heat wok or 10-inch skillet over high heat. Add oil; rotate wok to coat side. Add chicken and gingerroot; stir-fry 2 to 3 minutes or until chicken is no longer pink in centre. Reduce heat to medium. Stir in tomato sauce, chili puree and soy sauce. Spoon chicken mixture onto pizza crust to within 1/2 inch of edge. Top with water chestnuts, pea pods and onion. Sprinkle with cheese. Bake 15 to 20 minutes or until pizza is hot and cheese is melted. Sprinkle with cilantro. Substitution: Try topping the pizza with other Asian vegetables. Instead of or in addition to the water chestnuts, add sliced green onions, bamboo shoots and sliced mushrooms. 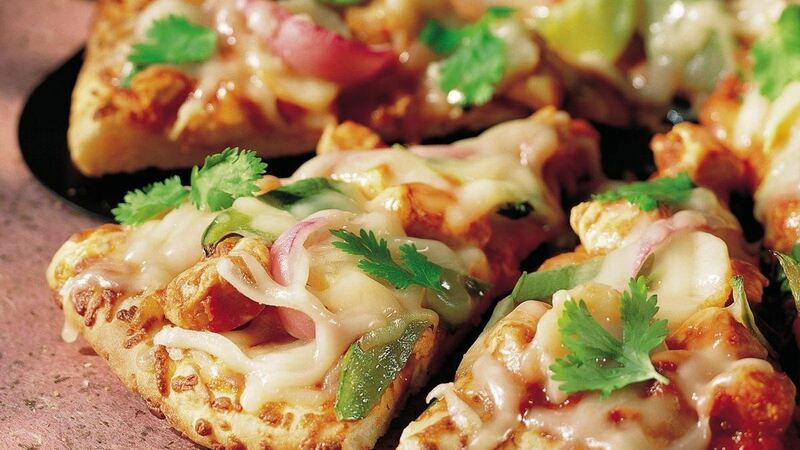 Special Touch: Cutting the pizza into small wedges or squares turns this recipe into a great appetizer. Serve With: Add an Asian cabbage salad and fresh pineapple.